Lizard Cam by Atomic Beam is the flexible, micro-inspection camera that snakes into tight, hard-to-reach spaces. It&apos;s easy to use just feed and view. The 4-foot long cable bends and flexes to fit into your desired space. At the end of the waterproof cable is a micro camera with a built-in LED light that sees all. View everything that the camera captures on the hand-held view screen. Use the snake camera beyond pipes and clogs. Attach the magnetic tip to the end of the cable and easily pick up screws, nails or other hardware you&apos;ve dropped but can&apos;t see. Look behind or underneath appliances without having to move them. Retrieve lost cat toys from under the refrigerator with the handy hook tip. Lizard Cam is a must-have tool. 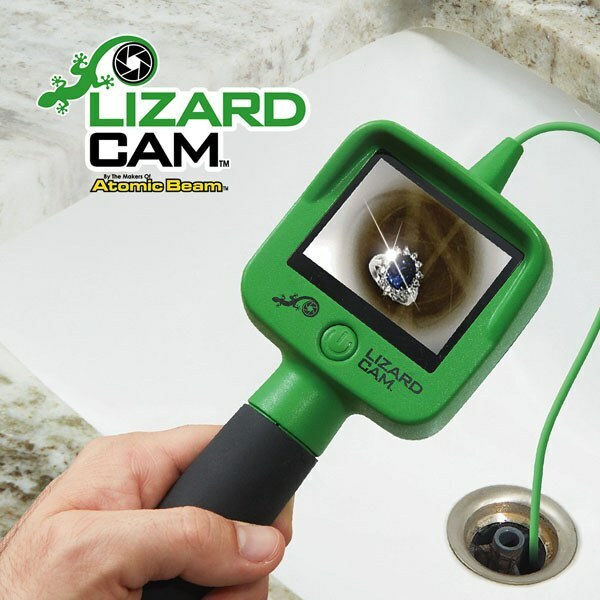 Now there is no need to sweat when you have a clogged toilet, clogged drain or need to see behind your appliances with Lizard Cam you can see everywhere. As seen on TV Lizard Cam features, 4" color LCD view screen, generous 4-foot cable in serpentine tubing and a camera with LED light, three tips (hook, mirror and magnet). Perfect for seeing inside pipes, drains, behind appliance or hard-to-reach places.